It was well over twenty years (whilst at University) since I had last slept in a hostel and I had been a bit apprehensive about it. Would people snore? Would I snore? Would I have one of the short but violent coughing fits that had woken me in the middle of the night the last couple of nights? Would someone go nuts and kill us all in our sleep? Or would I actually have a surprisingly good night’s rest and, so far as I was aware, not have annoyed anyone? It appeared to be the latter and I slept soundly in the dorm at Durness Youth Hostel all the way through until 7am when I had been wanting to get up anyway. I got dressed and went out to give the bike a quick once over and to take a more in depth look at the chain, which was still slipping a little throughout the day yesterday. On closer inspection I noticed that a couple of links had got slightly twisted. I did my best to manhandle the chain back into shape and put a good lot of extra oil on the offending links to try and help them work back into line. Over the next few hours riding it appeared that this has worked as the chain behaved itself all day. Done, I cleaned myself back up ready for breakfast. The SYHA ‘wee breakfast’ consisted of a bowl of coco pops and a croissant with coffee and juice. Not the most filling but it would get me going. Before leaving I sorted through my bags and arranged them such that I could leave as much stuff as possible at the hostel this morning; loading up only what would be necessary for the first part of the day’s riding. Having been thwarted in my attempt to make it to Cape Wrath due to the high winds yesterday afternoon I was going to try again this morning. The Cape Wrath ferry was located a couple of miles back the way I had come. I could thus make my attempt on the most North-Westerly corner of the country before heading back past the hostel at which point I could collect the rest of my kit before heading east towards my destination for the night: The Bettyhill Hotel. The first ferry was due to leave at 9.30am so I set off in plenty of time to get to the jetty. Just after leaving Durness a car heading the opposite direction stopped me to ask if I was heading for the ferry and to then tell me that it wasn’t running again today. I believe that this kind gentleman was the driver of the minibus that ferries foot passengers to and from the lighthouse. This was not promising but not entirely unexpected. I decided to push on to the ferry anyway; it wasn’t much farther and I might as well see for myself. Sure enough I pulled up to the slipway; there was no sign of the ferryman’s car and a note had been stuck over the timetable confirming that, due once again to the high winds, that there would be no crossings today. And so that was that. I had only two opportunities to get to Cape Wrath and they had both now been and gone. I would not be joining the ‘Cape Wrath Fellowship’ by making it to the most North Easterly corner of the British mainland. I would not be able to make the North West point of my ‘All Points North’ ride; I attempted to console myself by saying that I had made it the furthest such point as was accessible by bicycle during my time here. I was beaten by the weather, not by myself; I could live with that. Time to move on. I rode back into Durness stopping at the Spar shop for supplies on the way. I met a couple on a tandem outside the shop. We had a quick chat. They tried to convince me that Cape Wrath wasn’t that great. I think at that point my sense of disappointment was still evident. They told me that they had been there a couple of years earlier and despite being up this way again they had no interest in going back. They went on their way and after getting some lunch bits and pieces from the shop I headed back to the hostel to gather the rest of my belongings. Fully laden I was on my way and heading East. Leaving Durness the road closely follows the North coast for the first few miles; winding around the rugged rocky coastline. The wind that was preventing me getting across the Kyle of Durness was picking up and, whilst not directly against me, the going was not easy. Although not actually raining there was a lot of moisture in the air as well. The landscape was beautiful but it was tough going. Loch Eriboll was soon upon me and the road starts to bear to the South to follow its Western shore line. This meant that I was now turning head first directly into the wind. The road also started climbing as the direction changed. At this point I was starting to think that the day’s riding might not be great. Heading up the hill I came up on the couple on the tandem that I had met in Durness. If I was finding it tough then they were really struggling and going slowly. I rode with them for a couple of minutes and talked a bit with them but I needed to get on my way and I think that they wanted to just get on with pushing up the hill so I bade them well and headed on past them towards the brow of the hill. A few slightly easier miles followed. The wind was still blowing increasingly hard in my face but the road was now running downhill. The slope wasn’t enough to allow freewheeling in the wind, but it was still a respite after the previous efforts. I could begin to admire the cloudy views across the loch and to the mountains to the South. Just through the small village of Laird I passed another couple of cyclists. They were stopped to admire the view so we waved to each other as I passed by. As the slope flattened out at the bottom, the going got tougher again without the downhill assistance. The volume of traffic was also picking up making the going stop-start. Soon however I was at the head of the Loch and after a short stretch Eastwards I turned onto the other side of the loch and headed North. The wind was now behind me. What relief. My speed immediately picked up and the riding felt much easier and smoother. However I was not sure that I was going fast enough even now to out run the rain clouds that I could see were rushing down the valley towards me from the hills to the South. Sure enough the rains came and at the foot of a small climb I combined the natural slow down with a chance to stop and get my wet weather gear on. For a short while the rain was quite hard and in places along this side of the loch were a couple of sharp climbs. However, I was still enjoying it now that I had the support of the wind; I was lucky with my timing and felt sorry for my cycling companions who were probably still on the opposite side of the valley and now contending with both the wind and the rain. I looked across to see if I might see them anywhere but there was no clear sign of them; the other bank was farther away than I realised. Instead I enjoyed riding past some isolated farmsteads and an even more isolated chapel immediately next to the road. Doubtless a beautiful place to have a service, albeit for a very small congregation. Not long before the road bears away from Loch Eriboll for the final time another climb gave a chance to look down over the old Lime Quarry on the not-quite-an-island of Ard Neackie. I stopped in a suitably located layby to admire the view with the wind and rain lashing me. A few cars and motor homes also stopped; the occupants of only one of the vehicles got out to properly admire the sights though which seemed a shame; even with low clouds and high precipitation the outlook over Ard Neackie across the Loch and from there northwards to the sea was breath-taking. Carrying on, the climb took me up and over the hill separating Loch Eriboll from my next port of call, Loch Hope. Once at the top a short and satisfyingly winding descent had my heart singing again. Upon reaching the bridge over the weir at the North end of Loch Hope the singing quickly stopped. I was aware that there was a big climb up from here on the road Eastwards to Tongue. However I had another direction in mind. With my plans for Cape Wrath out of the window I had some time on my hands. I had allocated 2-3 now unused hours for the trip across to the lighthouse. The direct route from Durness to my next stop at Bettyhill was only 40 miles; far enough but I was hoping to make more miles today. I had therefore put in place a plan in case I was a) able to get to Cape Wrath on the previous day or b) was not able to do so at all. Time to put that plan into action. Instead of continuing East along the A838 I was going to avoid Tongue completely and head South alongside Loch Hope. I was therefore going to miss the steep climb. Hurrah. Correction. I was going to miss some of the steep climb. I was probably in fact still going to miss most of it, but turning a corner I came face to pedal with a short but very sharp climb up the East bank of the loch. Ok I admit. It completely threw me and I got off and pushed. However I can say that this was the only occasion on the whole tour when I did so; which was a great improvement on my previous tours on the C2C and Lon Las Cymru routes. Even now, the pushing didn’t last long and, once past the worst, I persuaded myself back into the saddle for rest of the rise until I came to the sign pointing me back South in the direction of “Altnaharra (21 miles)”. I was pleased to be leaving the main road but was very aware that I was now heading into some very remote areas. I was also heading back into the wind again for 20 miles or so. The first few miles along the loch side were tough going. The wind was noticeable but not so awful. The main reason for being tough was that these miles felt like riding along a long, straight Waltzer track. Up and down and up and down and… repeat repeat repeat. There was no particular height to any of the ups but neither was there any rest on the downs; it was just impossible to get a decent rhythm going and the riding was a slog. The few miles after that were tough going. The road dropped back down to the lochside but as the road opened up by the flat open side of the water the wind increased. I’d done about thirty miles by now and was in need of a bit of food. I managed to find a big rock by the side of the road to shelter behind. Suddenly I was out of the wind and it felt great. I got my food from the pannier and settled down to eat. I then realised that I was not the only one making the most of having found the one place out of the wind. The whole of the Loch Hope midge population were in the same place. And they also had settled down to eat. I stuffed down a Babybel and a square of Orkney tablet (the world’s best fudge) to get some energy in and then rushed back onto the bike before my legs and face got completely chewed to pieces. The next few miles were even tougher going. After the open loch side I had now reached the top of the main body of water and the flat loch side was giving way to a steep valley with the slopes of Ben Hope rising directly above me. The valley here had formed a natural wind tunnel. I was getting used to the wind by now though, and the river valley is absolutely glorious. The Strathmore River flowing from the hills ahead to the Loch below is picture perfect. I could see the attraction of spending a day fishing in its waters. The road passed over a couple of small rivers which rush down in beautiful water falls from the hills. Clearly in recent times there had been some very wet and wild days. The bridges over the streams had been washed away and replaced with some roughly piled together stone “bridges” to carry the road over the rivers. Further up the valley I passed the car park for the path up to Ben Hope. There were quite a few cars parked here. I had seen a couple of vehicles on the road so far and now I realised where they were going. I thought I would have the road largely to myself. From here on in this would be largely the case. Continuing a few more miles up the wind tunnel/river valley the road passes immediately next to the ruins of Dun Dornaigil Broch. These must be some of the better broch remains to visit. The broch has apparently never been investigated or excavated; the ruins are so far away from the nearest pub I don’t think that any self-respecting archaeologist has ever chosen to spend time here*. A couple of (motor)bikers were here at the same time but they soon went on their way and I had time to explore on my own. You cannot access the inside of the ruins but instead I enjoyed climbing a short way up the boggy hillside to get a good look at the Broch in its landscape. I can certainly see why people might have chosen to live here in the past. *I used to be one; I’m allowed to say that..
Back underway and the road starts to climb up away from the river and onto the hills. The climb is long and steady. It shows up on my Strava graphs as a big steep climb, however it was lovely. Nice and steady and you could “feel the benefit” of the effort in getting up the hill. Although I was now getting into more open territory the wind felt like it was lessening due to the loss of the wind tunnel effect. It was still strong but much less intense. As the road opens up onto the hills the views become even more remarkable. I was now not too far away from the road I had travelled yesterday and I could look across to Foinavon and Arkle and Ben More. I could also see almost no sign of life. It was blissful. This was exactly what I signed up for. Towards the top of the hill I was expecting to find the first such signs. I was using an Ordnance Survey 1:250,000 scale road map which covered the whole of the North of Scotland. Marked on the map was the settlement of Allnabad. It transpires that things are so remote in these parts that a single derelict shell of an abandoned building was enough to be marked on such a large scale map. The road was still continuing to climb, but at a very easily manageable gradient now. Finally a car came past me. The family inside all leaned out of the windows to cheer and wave me on and I was happy to wave and cheer back. I was soon back on my own though and to my left appeared the waters of the hill top Loch Meadie. I was now at the summit of the climb and at the watershed between the Strathmore and Strathnaver valleys. Up here is probably just about as remote a location as it is possible to get to by road in the British Isles. I stopped for a bite to eat and to take it all in. I set my camera phone up on its mini tripod in order to take a selfie in the middle of nowhere. The best way to do this on my phone is to shoot a hi-res video and then take a still shot from that. The video I captured (I’m not sharing it here!) has me screaming like a loon into the wind making the most of the opportunity to scream and sing into the wild emptiness of this part of Sutherland. 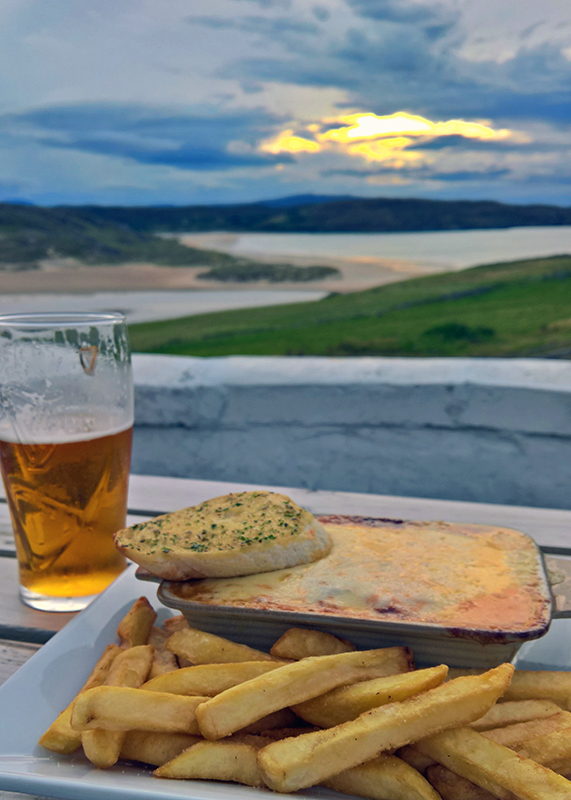 I was in my element and by now I was glad that I had not been able to get to Cape Wrath; had I been able to get across the Kyle of Durness I would not have had the time to add this diversion. I would have been just riding along the main road alongside all the North Coast 500 tourers. I was actually thankful for the wind that had in one, unexpected sense, actually driven me up this road. It was still tough going though. Even though I had now turned eastwards such that the wind was at my side rather than into my face it was still impeding progress and I would soon get annoyed by it again. Although I was heading downhill again now, the wind was still strong enough to make it feel like I was riding on the flat and there was no chance to just free wheel. Despite that progress was still OK and I was soon at the crossroads with the A836 just north of Altnaharra. At this point I could have turned left on the main road and I would have been back on NCN 1 heading for Tongue. Instead I cut straight across onto the B873 along the north bank of Loch Naver. Just a few yards over the crossroads I pulled over for a rest and a celebratory snack or two. The location was not the most spectacular but I had been watching my cycle computer and my odometer had just ticked over to reveal that I had just completed the 10,000th mile on my trusty Ridgeback tourer. Refreshed and cheered and having thanked my bike (despite now being on a B road there was no one around to witness this spectacle fortunately) I headed on. The wind was still blowing strong and though it was now a side wind the effects were still noticeable. I was still being slowed down and this would remain the case for another 7 miles. As well as my maps, I had also now had to hand the excellent Strathnaver Trail map produced by Strathnaver Museum. The trail consists of 16 historical and archaeological sites dotted along and close to the road from here all the way down the valley to Bettyhill. I did not stop to visit all 16 but I think that I did get into double figures. The first two sites were fairly close to the road whilst still along the loch side. I did not stop to look at the cleared settlement at Grummore but did admire the remains of the nearby broch sitting immediately on the bank of the loch next to a caravan park. Next up was another settlement at Grumbeg. Being closer to the road I did stop to look around here; happily leaving the bike and all my kit unlocked on the roadside. The former buildings have long since been reduced to mere outlines but the presence of a Neolithic chambered cairn indicates that there had likely been continuous settlement on the site from that time right until the 19th century clearances; when the people were moved out to make room for more sheep. Although remote I could certainly see the upside of living in such a beautiful area; though the sheep seem to enjoy it here also. After Grumbeg the road continues along the loch for a few more miles. I was feeling tired now but was looking forward to what should be some easier riding at its foot. Sure enough, at the end of the loch the River Naver diverts out of the side of the loch and the valley, and the road turn sharply to face the North and head for the coast. Instantly I could feel the effect as I was racing down the valley at such different speed from anything that had come before me today. I left the sites on the other side of the river (which are all a longer distance from the road) unvisited and only stopped briefly at the monument to the author of “Gloomy Memories”; an account of the clearances. I continued racing onwards and was soon coming into the first settlement (of half a dozen houses) at Syre with its lovely (though rather damp smelling) corrugated iron church. At Syre the road joins with another B class road coming in from Kinbrace, but there was no increase in traffic and I was largely still on my own. At Skail I stopped to visit both the chambered cairn and the “Red Priest’s Stone”; both of which were worth the short diversions. There was a glorious afternoon light at the cairn and the stone, whilst small, was nice to come across. The river valley here as well is glorious. I spent a few minutes watching a Heron fish in its waters and considered that there would be worse places for a priest to pray and in which to be laid to rest. The road continued along the beautiful river valley. My legs were beginning to feel the effects of a third long day but the riding was so glorious I didn’t mind in the slightest. Before too long I came to the junction at which I would re-join the A836. Having now completed my diversion I can fully endorse this route. In particular I remain at a loss to understand why the official NCN route from Altnaharra follows the main road rather than cutting along the Naver Trail. I can only imagine that it is to direct cyclists into Tongue. There is no reason on earth not to follow this quieter and quite spectacular road; and indeed to make the most of the truly superb trail. To anyone riding this way I make the strong suggestion to use this road. Back though on the main road, I continued down the valley and across the bridge on to the East bank of the Naver. At this point I decided that, although tired, I would double back to investigate a couple more of the Naver Trail sites that were back up the valley. I immediately questioned my decision as I turned back into the wind but I was soon at the site of two brochs which I enjoyed investigating. I did, however, decide that this was quite enough for the day and, particularly as my large scale maps did not give me a good idea of how much farther on it was, I elected not to press on to visit the final site on this side, another clearance village. Instead I headed back for the final mile into Bettyhill. Bettyhill. Not Bettyvale or Lower Betty. Bettyhill. Not a huge hill I admit, but not quite what I wanted at the end of the day. I pushed up though, overtaking for the second time today the pair of cyclists I had seen back at Laird much earlier in the morning. I was also pleased to discover that the Bettyhill hotel was almost the first building in the village and I gladly pulled into the hotel and went immediately to the bar to obtain a well-earned beer which I quickly drained sitting on a bench outside the bar admiring the view before checking in and having a shower and quick rest. To finish the day I headed downstairs and ordered a less than healthy, but very tasty, lasagne and chips which I ate (much to the amusement of the staff) outside on the same bench. My legs needed a warm down so I went for a walk to explore the village and walked to the old harbour and fish factory. It was a lovely walk but the last of the light was quickly vanishing so I headed back to the bar for another pint and to listen to the landlord telling stories of his time in the RAF. Relaxed and ready for bed I went to my room where a peaceful night’s sleep rounded off a truly amazing day.